MISSISSAUGA, Ontario (24 March 2011) - Panasonic Canada has unveiled its 2011 television, home theatre and Blu-ray player line-up, which the consumer electronics giant believes will excite every important customer group from tech enthusiasts, movie buffs and audiophiles to the typical Canadian family. This year, Panasonic has expanded its VIERA branded full HD 3D plasma and LED/LCD televisions to include IPTV connectivity on all models, improved picture performance and efficient operation. In addition, Panasonic has expanded its proprietary IPTV functionality with the introduction of VIERA Connect 1 on select models. This new interactive and inter-connected cloud-based Internet enabled service allows consumers to personalize their IPTV experience with additional applications from third-party developers as they become available. Plus, VIERA Cast's popular sites - including You Tube, Twitter, Bloomberg News, a weather channel and Skype - continue on VIERA Connect in addition to other apps such as CinemaNow, Facebook, SHOUTcast, MLB.TV, and online games. Two models in Panasonic's full HD 3D VT30 series feature one sheet glass design, giving the TVs a sleek, new appearance while providing both 2D and 3D USB connectivity with an included wireless LAN adaptor, a PC input as well as three USB ports and four HDMI connections. One pair of HD 3D eyewear is included. The VIERA S30 series includes four Full HD 1080p resolution models ranging from 42 to 60-inches and includes three HDMI inputs. Panasonic's LED-LCD line-up now features eight models including two full HD 3D sets. All new LED-LCD televisions offer the IPS Alpha panel (except the 42-inch E3 model), recognized internationally for its fast response time and energy efficiency, providing wider viewing angles and high light transmission rates. 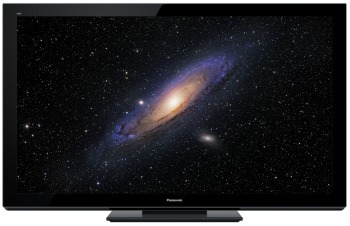 The TC-P65VT30 from Panasonic is one of a new series of full HD 3D televisions launched for 2011. This unit features a one sheet glass design, giving the set a sleek look. It features THX 3D display certification, wireless LAN adaptor, a PC input and three USB ports and four HDMI connections. Panasonic's expanded Blu-ray disc player line-up includes three full HD 3D models and a new 2D model. The three 3D models feature 2D-3D conversion which converts 2D images from DVDs and Blu-ray discs into 3D with natural depth perception. Two models feature a built-in Wi-Fi system, while another requires an optional wireless adaptor for local area network connections. Also on tap are three new full HD 3D Blu-ray disc home theatre systems, each equipped with a 3D effect controller, playback, cinema surround sound and an internal wireless LAN system. Each also comes with a universal doc for the iPod and iPhone. As part of its home theatre offering, Panasonic has also introduced the SC-HTB520, a slim sound bar style speaker system that mounts on a wall next to the television. The company said it's an easy to install, stylish sound system alternative. For more information, visit the company's web site at www.panasonic.ca.